Hiking is one of the most affordable and accessible outdoor activities. Hiking trails aren’t just hidden away in the mountains; they’re hidden in cities too. You don’t need any special equipment to enjoy hiking, and you don’t need special training- just enough stamina to complete the journey. However, having the best hiking boots make hiking easier and a more enjoyable experience. If you like to hike on a regular basis, however, it’s worth investing in a good pair of hiking boots. The wrong footwear can result in sore feet, blisters, and worse. If your shoes aren’t waterproof, you can end up with wet feet and soggy socks, which can lead to more blisters or illness. 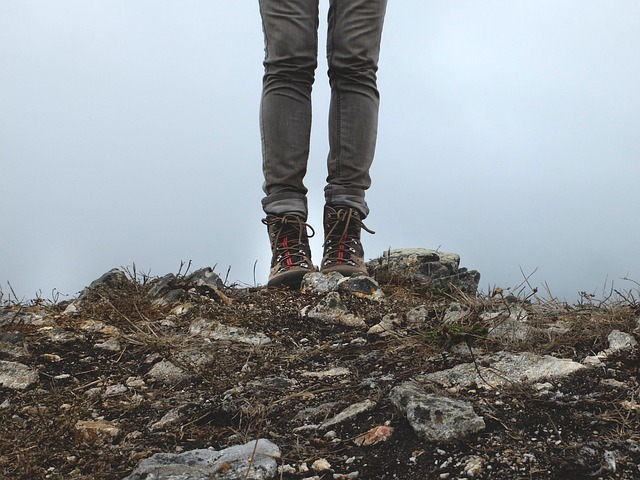 Some people are hesitant to purchase hiking boots because they see them as bulky, unattractive, or too heavy, but if you go on long trips the protection they offer is definitely worth it. We’ve compiled a list of the top lightweight, waterproof hiking boots in 2019, for both men and women. However, if you're going on a steep hike make sure to have trekking poles to help support your shoe grip and make sure you don't slip. These are great for long hikes, but if you want to just run on trails we recommend you checking out our favorite trail running shoes. This high-traction, waterproof hiking boot from KEEN offers better stability, preventing you from slipping and sliding on the trails. It weighs just 1.5 pounds, has a rubber sole and offers the wearer excellent flexibility. The KEEN Men’s Marshall Mid WP Hiking Boot is available in the following color combinations: Black & Burnt Olive, Raven & Neutral Gray, and Raven & Spicy Orange. Reviews of this lightweight hiking boot praise the quality of the waterproofing and how comfortable they are. They fit true to standard sizing, are warm, and you’ll feel like you’re wearing sturdy slippers! KEEN also offers great options for women who love to hike. The Targhee II is a leather boot with a rubber sole. Reviewers praise the lightness of the 4 pound pair of shoes, and many share personal hiking stories that remind us that the right pair of hiking boots allows less focus on your feet and more focus on your experiences and the people you’re with. Its sleek design is available in a variety of colors, and the breathable membrane prevents sweaty feet. If you’re looking for a sleek women’s hiking boot, you’ve found one! Merrell’s Women’s Salida Mid Waterproof Hiking Boot looks like a cute, sturdy tennis shoe. Available in brown with either pink or teal accents, this pair of extra-cozy boots weighs in at just one pound. Reviews praise how it combines form and function, resulting in a durable, long-lasting hiking boot. Another great Merrell product, this time for the guys! The Moab Ventilator is leather and mesh, has fresh odor protection, and a dry moisture-wicking wet lining to keep your feet warm and dry. Reviews praise the comfort of this boot, while noting that like a lot of hiking boots, they do run a bit small, so you’d best try them on before purchase or order a half size above your normal size. Reviewers do praise Merrell’s customer service, and the ease of returning shoes that are not the right size. Columbia’s Mudhawk hiking boot is a full-leather boot that you can hose off while you’re still wearing and not worry about your feet getting wet. Most reviews rave about their lightness and water resistance, while stating that they’re true to size. In case you do have problem with the sizing, the company offers easy free returns, something all online shoe providers should offer. These lightweight waterproof hiking boots prove that hiking footwear doesn’t have to be dull and bulky. Reviewers loved the look and feel of these boots, as well as the feel of their feet after long days of hiking. These are on the lower end of the price spectrum of lightweight waterproof hiking boots, but reviewers seem to agree that they’re not lacking in quality. Timberland’s White Ledge Waterproof Boot comes in a variety of colors, including black, brown, and yellow. The boot itself is completely made of leather, while the meshing is synthetic. Depending on the size, these weigh in at 2-4 pounds for the pair. This light boot does require some maintenance to remain waterproof and unscuffed, as all leather boots do. Reviewers do cite the importance of wearing thick hiking socks, as those who haven’t have received blisters. Considering the terrain and activity of hiking, wearing heavy socks that don’t wick water is good advice no matter which hiking boots you choose. These are just some of the great hiking boots that 2016 has to offer! If you’ve had experience with any of these brands, or another lightweight waterproof hiking boot, please share in the comments!